Governor Udom Emmanuel has called on Christians to continually reverence God, even as he has warned people to be wary of fake preachers who are not true messengers of God. 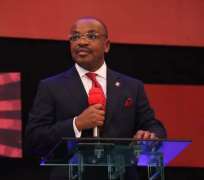 Governor Emmanuel, Sunday, during a convention service at Insight Bible Church in Uyo said that God can overturn a circumstance for the sake of his name, stressing that only a fool says there is no God. Despite the antics of the naysayers and the prophets who swore to end their pastoral sojourn should he become victorious in the elections, he said that God manifested himself. "I wasn't invited to this convention, I just told my team we'll be worshiping at Insight Bible Church. My wife comes here once we don't have any state function to attend. "As a Governor, I'm a member of every Bible believing church where the truth is preached. "Not those fake churches ooo. Those ones that said if Udom Emmanuel doesn't lose election let it be known that God didn't call them. There are two types of pastors, the ones that God called and the ones that called God." The state chief executive attributed the 2019 victory to the awesome power of God in the affairs of men and thanked God for defending His name and upholding the confidence of those whose trust are in him. "I thank God for guaranteeing us victory, this further attests to our belief that those who put their trust in God can not be forsaken. It has also boosted the confidence of our people in the awesome power of God." The state chief executive said as a child of God, worship is entrenched in his personality and thanked God for the opportunity to share with the saints in fellowship. He applauded the Insight Bible church for the theme of this year's convention, "Display of God's wisdom", saying that the wisdom of God is marvelous and anyone who leans on him exhibits excellence. Preaching on the theme "Displaying of God's Wisdom," Rev Effiong Efiom who culled his text from the book of Judges Chapter One verses seventeen and Psalms One verses two said when the Spirit of God descends on a person wisdom is a natural attribute. The cleric cited the exploits of Joseph, his dream and subsequent misfortune into slavery and his emergence as the Prime Minister in Egypt and called on all to pray for wisdom and direction. He thanked God for the victory of Governor Emmanuel and other winners, saying the church has been vindicated for taking a justified stance in defense of the Governor. "Governor Udom Emmanuel was divinely sent to Akwa Ibom and we pray God to endow him with wisdom and protect him in all his endeavors for the prosperity of Akwa Ibom and the Glory of God," the cleric added.